In trying to determine what is true and what is false in the world, one need only to look at Jesus’ “self-giving love primarily turned to those who have no one to turn to,” said the Very Rev. Anders Gadegaard, dean of Copenhagen Cathedral. 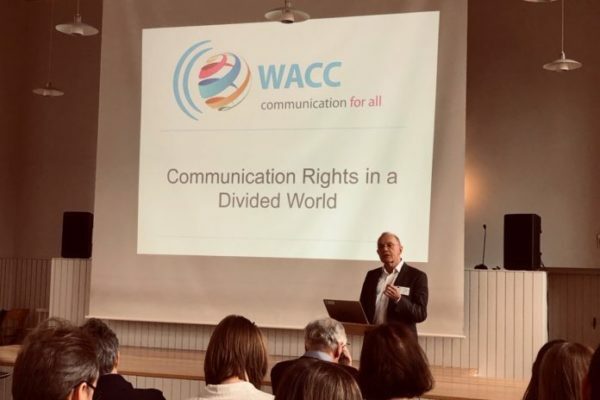 Addressing a gathering of Christian communicators April 10 in Helsinki, Gadegaard also said all kinds of hate speech contradict Christian principles and must be opposed. The criterion for judging truth was given with the birth of Jesus, who as an adult said, “I am the truth,” said Gadegaard. “The little baby who was born outside marriage in rough poverty, who soon became a refugee…” The same one who, as an adult, experienced hatred and contempt from the powerful, admiration from the poor and outcast, and was betrayed, imprisoned, tortured and killed, he added. Christ’s words, deeds and examples as the criteria for truth enabled societies inspired by Christian values to create institutions and news media “truly critical” of ruling political elites, he said. The idea of Ombudsman has its roots in Western Protestant tradition, he added. Societies inspired by Christianity have also funded human rights organizations, he said, adding, “This is Christian social ethical values working at its best.” In the same vein, societies that claim to build on Christian values, “where a critical journalism is turned into biased or even purchased journalism…is a sign of decay in Christian moral,” said Gadegaard. The privatization of media has made this more and more possible, he added. Just as there are debates in the secular world over the criteria for determining what is true and false, there are also intense discussions among Christian theologians about “true theology and fake theology,” said Gadegaard. Another example of fake theology is “the nationalist theology that claims the right to a certain area of land in the name of God,” he said, citing Zionism and Nazi Germany’s philosophy of Blut und Boden (Blood and Soil). There is nothing wrong with establishing personal and national identities for as long as they are not used to exclude people, he added. Jesus himself was constantly “including foreigners and praising them for their faithfulness,” he said.